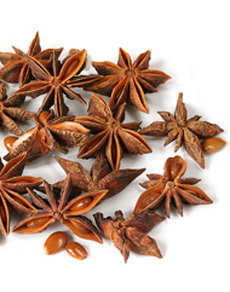 star anise courtesy Wikimedia. There are some spices in the cabinet that you use more often than others: chili powder, cinnamon, garlic powder or paprika, for example. And then there are those that were bought for a recipe—like cardamom for Christmas cookies or cloves for the Easter ham. After you’ve made the recipe, the bottle of spice just lingers on the shelf. Cardamom is a popular ingredient in India (its home), as well as in Middle Eastern and Scandinavian dishes. You can use it every day to flavor tea or coffee, curries, desserts (including rice pudding) and mulled wine. Steep it with your tea—add some cloves, cinnamon, ginger, nutmeg and peppercorns—and you’ll have made masala chai (spiced tea). Perhaps it’s time to make chai rice pudding. Cloves, whole or ground, cloves can be add to soups, stews or curries. Whole cloves are either steeped or studded into an ingredient (ham, leg of lamb, onion, potato and oranges, for example—in fact, if you have too many cloves, make pomanders). Add a bit of clove to marinades and sauces. Steep a few cloves with your favorite tea. Use ground cloves to season fish and seafood. Bake a spice cake with cloves, cardamom and your other “holiday spices”—delicous flavors that should be enjoyed year-round. Star anise is perhaps the least known of this trio, but it’s very versatile—try it in anything form pork dishes to teriyaki. It gives a bit of Asian flair to everything, including soups and stews. Our chef pops one star into just about everything—even when he’s just sweating onions. In the drinks department, it’s the perfect season to add star anise to hot cider, mulled wine and tea. Want suggestions for how to use up your spices? Just ask! Have you checked your spices for freshness lately? See how.